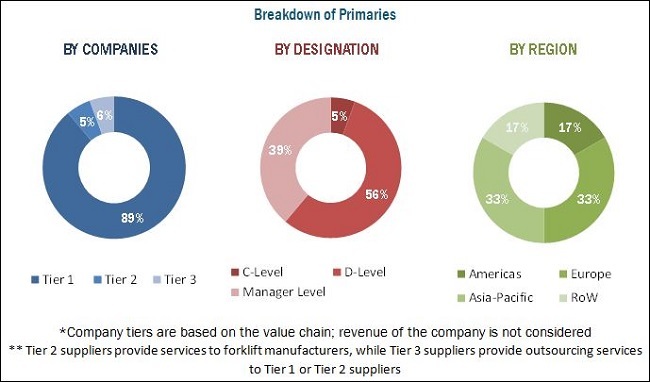 [141 Pages Report] The global forklift market is projected to grow at a CAGR of 1.93%, from USD 16.00 billion in 2016 to USD 17.61 billion by 2021. The base year for the report is 2015 and the forecast year is 2021.The global forklift market is driven by the less than 5 ton capacity forklifts which accounts for major market share in terms of volume. The less than 5 ton capacity majorly includes battery-electric forklifts as well as Internal Combustion Engine (ICE) forklifts but the battery-electric forklifts penetration in this segment is highest. To provide a detailed analysis of various forces acting in the global forklift market (drivers, restraints, opportunities, and challenges). To analyze the regional markets for growth trends, future prospects, and their contribution to the overall market. To analyze and forecast (2016 to 2021) the market size, in terms of volume (‘000 units) and value (USD million), of the global forklift market. To segment the market and forecast its size, by region, by class, by tonnage, by application and by fuel based on region—namely, the Americas, Europe, Asia-Pacific and the Rest of the World (RoW).which covers Africa and Oceania. To segment the global forklift market and forecast the market size, by volume and value, based on class, tonnage capacity, application and fuel type and region. To track and analyze competitive developments such as joint ventures, mergers & acquisitions, new product launches, expansions, and other activities carried out by key industry participants. Various secondary sources, such as company annual reports/presentations, press releases, industry association publications, forklift magazine articles, encyclopedias, directories, technical handbooks, world economic outlook, trade websites, technical articles, and databases have been used to identify and collect information useful for an extensive study of the global forklift market. The primary sources-experts from related industries, forklift manufacturers, and forklift suppliers–have been interviewed to obtain and verify critical information, as well as to assess future prospects and market estimations. Bottom-up and top-down, both the approaches have been used for market estimation and calculating the global forklift market size. The global forklift market consists of various major manufacturers such as Toyota Industries Corporation (Japan), KION Group AG (Germany), Hyster-Yale Material handling Inc. (U.S.), Jungheinrich group (Germany), Mitsubishi Nichiyu Forklift Corporation (Japan), Crown Equipment Corporation (U.S), Hyundai Heavy Industries (South Korea) and Komatsu Limited (Japan). In May 2016, Jungheinrich introduced the first lithium-ion-battery-powered vehicle in the 48-volt range with a battery capacity of 360 and 480 ampere hours. The completely maintenance-free battery technology will be applied to counterbalance forklifts and reach trucks. In February 2016, Crown Equipment Corporation launched a new forklift, the Crown WAV 60 Series, which offers higher levels of safety, efficiency, and flexibility than previous models. This model is designed for applications in which ladders are typically used to access high places, such as manufacturing and retail applications. Which new market players are disrupting the market and what percentage of share are they catering? The global forklift market is projected to grow at a CAGR of 1.93%, from USD 16.00 billion in 2016 to USD 17.61 billion by 2021.The base year for the report is 2015 and the forecast year is 2021. The market size in terms of volume is estimated to reach 1.5 million by 2021. The Increasing trend in e-commerce & warehouse segment and the technological advancements are the major driving factors for the global forklift market. The battery-electric segment is estimated be the fastest growing during the forecast period. With the increased focus on fuel efficiency and emission norms, a majority of the forklift manufactures are focusing on battery operated and fuel cell powered forklifts in order to provide better efficiency. The manufacturing segment is estimated to hold largest market size of forklifts in 2016, Owing to rise in demand for infrastructural development. However warehouse segment is expected to lead the market by 2021 majorly due to increasing number of warehouses being set up across the regions, reducing trade barriers between various regions, and preference towards low cost alternatives. The wholesale and retail distribution is projected to grow at the highest CAGR from 2016 to 2021. The below 5 ton capacity segment is estimated to record the largest market size, growing at a CAGR mentioned in the report. The below 5 ton capacity forklifts includes all type of fuel but are majorly battery-electric forklift. These electric forklifts are being adopted rapidly as they are environment friendly and relatively silent during operation, have low operational & maintenance costs, and are easier to operate than the ICE forklifts. Asia-Pacific market is estimated to be the largest market with a highest market share of the global forklift market by value and volume. As of 2016, the adoption of forklift in the Indian and Chinese market is estimated to be low, but this trend is projected to increase rapidly in the near future. The Class 3 type of forklift is estimated to be the fastest growing in forklift market. The class 3 includes electric warehouse pedestrian trucks. It is estimated to grow at CAGR as mentioned in the report. This is due to the increasing trend of electric forklift being used by the material handling departments and warehouses, as electric forklift are environment friendly and more efficient than ICE forklift along with cost advantage. The less than 5 ton forklifts are the compact types of forklifts which are primarily used for indoor applications, as their lifting capacity are limited. The less than 5 ton capacity includes battery-electric forklifts as well as ICE forklifts. Battery-electric forklifts penetration in this segment is highest and contributes approximately 90% of overall forklift market. This is mainly due to its uses in warehouse, factories, and in indoor applications. The growth of battery-electric forklift in less than 5 ton segment is expected to grow, owing to stringent emission norms for diesel forklifts. The 11-36 ton and above forklifts are considered as a heavy duty forklift. These forklifts are majorly used by steel plants, metal factories, logistics managements, and other heavy industrial purposes. The heavy duty forklifts engines are generally diesel or gasoline driven, out of which diesel engine share is greater than the gasoline one. The heavy duty forklifts are normally used in outdoor activity only. 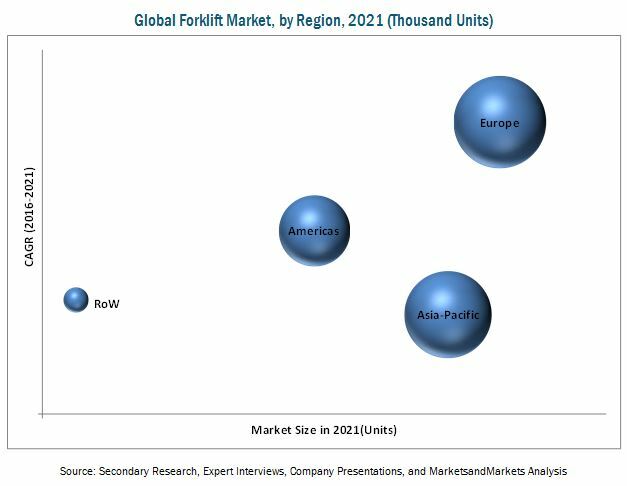 What are the upcoming market scenario for global forklift market? The major restraint considered in the study is the increase in Third Party Logistics (3PL) services. The increase in 3PL services will further reduce the demand from end users like manufacturing companies, logistic companies among others. High cost of battery operated and fuel cell forklift is another restraint for forklift manufacturers. The global forklift market is dominated by many international as well as domestic players, and some of them are Toyota Industrial Corporation (Japan), KION Group AG (Germany), Hyster-Yale Material Handling Inc. (U.S.) and Mitsubishi Nichiyu Forklift Co., Ltd. (Japan). 12.3 Hyster-Yale Materials Handling, Inc.
12.5 Mitsubishi Nichiyu Forklift Co., Ltd.
12.8 Anhui Heli Co., Ltd.
12.10 Hangcha Group Co., Ltd.